President Muhammadu Buhari has stopped the Inspector General of Police, Ibrahim Idris, from inviting the Osun Governorship candidate of the Peoples Democratic Party (PDP) Senator Ademola Adeleke. A source from the Presidency who pleaded anonymity confirmed this development to journalists on Wednesday. The Police had earlier invited Senator Adeleke to appear at its headquarters to answer questions bordering on allegations of Examination Malpractice, Criminal Conspiracy, Personation, Breach of Duty, Aiding and Abetting against him. But the move is seen as an attempt to stop him at all cost. 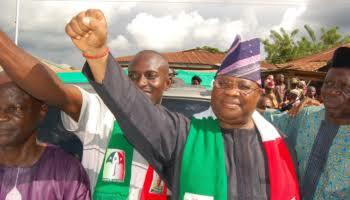 Consequently, Buhari ordered that Adeleke should not be invited until after Saturday’s election.